Bodog is best known as one of the leading online sportsbooks, but the site also offers customers a great number of other services. A secure Poker Room is available to those who favor multiplayer table games, while the Bodog Casino offers a huge range of titles for all types of gamers. RealTime Gaming looks after the software for Bodog Casino. The download size of the casino is quite small, and you will be playing online in no time at all. Surprisingly, despite it being such a quick download, the casino looks incredibly detailed and well designed. Every game has its own charm, transitions between games are swift, and the menu interface is completely user-friendly and easy to pick up. There are no glitches to be found at both the downloadable, and Instant Play casinos. To enjoy the entire range of more than 70 unique games, you will have to download the Bodog Casino; if you plan on simply playing at the Instant Play casino, your options will be limited, but there will still be plenty of hours worth of entertainment. All the standards are there including Blackjack, Poker, Slots, Video Poker, as well as Specialty and Featured Games. While the Bodog Casino doesn't specifically cater to multiplayer and tournaments, you can sign up to the Poker Room to enjoy all of its online capabilities. There are plenty of tournaments held throughout the year, so if you are interested in taking part in multiplayer events, your best bet is to join the Bodog Poker Room. There are plenty of bonuses on offer at Bodog Casino. In addition to a 100% sign up bonus of up to $500, you will also receive a 10% deposit bonus on your first cash transfer. There are also loyalty rewards, and a special bonus of up to $30 for each time you refer a friend to the Bodog Casino. 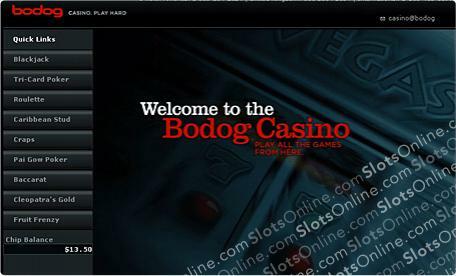 Bodog Casino offers a wide variety of games, bonuses, and excitement for those who appreciate all facets of online gambling. Whether you are simply playing a game of Blackjack in between sportsbook tips, or preparing to compete in an upcoming online tournament, Bodog Casino is the place for you. Withdraw Options: POLi, Moneybookers, NETeller, Click2Pay, Bank Wire, Checks.